Rinse the liver in a colander under cold water and drain well on kitchen paper. Melt half of the butter with the oil in a large non-stick frying pan over a high heat. Put three tablespoons of the flour in a large bowl and season with salt and freshly ground black pepper. Coat half the liver in the seasoned flour, shake off any excess, then fry each slice in the hot fat for 1–2 minutes on each side until lightly browned, but not completely cooked through. Transfer the slices to a plate and repeat with the remaining liver. Reduce the heat and melt the remaining butter in the same pan. Add the sliced onion and cook for a minute or so, stirring to separate the layers. Add the bacon to the pan and cook, stirring from time to time, for 8–10 minutes or until the onion is pale golden-brown and the bacon is beginning to crisp. Sprinkle the rest of the flour over the onion and bacon and stir it for a minute or so. Dissolve the stock cube in the just-boiled water and pour slowly into the pan, stirring constantly. Bring to a simmer and cook over a medium heat until the gravy is thickened. Add a dash of tomato ketchup and season with salt and freshly ground black pepper. Return the liver to the pan with the onion gravy for just 1–2 minutes to warm it through and finish cooking. 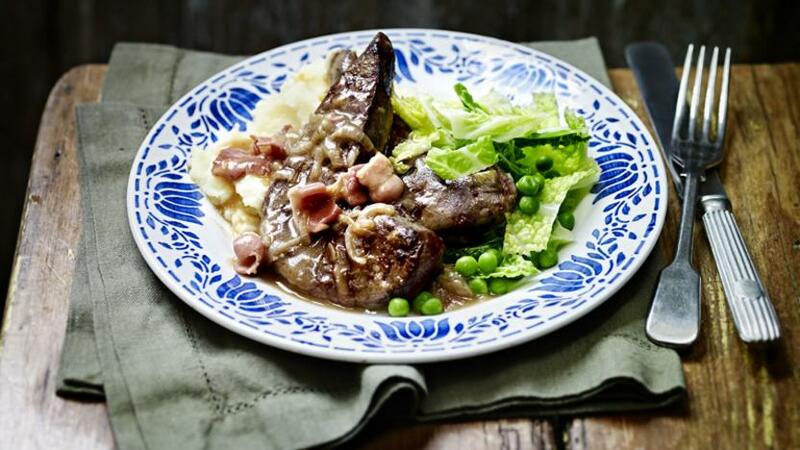 Serve the liver and bacon with some mash and freshly cooked greens.